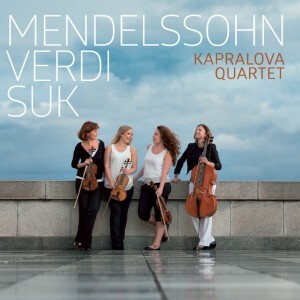 Kapralova Quartet - Felix Mendelssohn-Bartholdy - Mediální ohlasy - ArcoDiva management - Hudební agentura - Hudební agentura ARCO DIVA Management s.r.o. Founded in 1995 as the Prague Venus Quartet, in 2000 this ensemble took the name of the composer Vítežslava Kaprálová (celebrated as Composer of the Week on BBC Radio 3 w/c 12 October 2015). In about 2008 there appears to have been a reorganisation which left the second violinist as the sole founding member still in place. I am told that the present leader is the daughter of the first violinist of the great Panocha Quartet. As now constituted, the group plays to a very high standard but, perhaps in recognition of a burgeoning international career, does not insist on the two acute accents on its title. The English-language version of its website even omits the accents and a single hacek from the individual members’ names. My heart always sinks slightly when I see that an ensemble has recorded one of Mendelssohn’s early quartets rather than one of the mature works – I emphatically do not subscribe to the view that Mendelssohn ‘went off’ after a promising start. Well, the Kapralova players cheer me up straight away by playing the opening phrases of the E flat Quartet ravishingly and maintaining this standard right through the Adagio introduction, before setting a good tempo for the Allegro and keeping up its impetus to the end. The famous Canzonetta is delightful and the equally brief Andante finds the players taking Mendelssohn’s ‘espressivo’ to heart, with heartfelt phrasing which never tips over into vulgarity. They really get stuck into the finale, while also playing its quieter moments sensitively.